Book on Surveillance in Europe now available! findings and recommendations regarding surveillance in Europe. 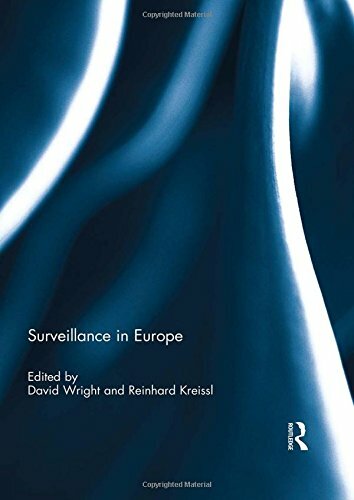 Surveillance in Europe’s interdisciplinary approach and accessible content makes it an ideal companion to academics, policy-makers and civil society organisations alike, as well as appealing to top level undergraduates and postgraduates. Contributors to the book include : Anthony Amicelle (Université de Montréal), Kirstie Ball (Open University), Johann Čas (Institute of Technology Assessment, OeAW-ITA, Austria), Paul De Hert (Vrije Universiteit Brussel), Michael Friedwald (Fraunhofer Institute for Systems and Innovation Research), Gemma Galdon Clavell (Eticas Research & Consulting/Universitat de Barcelona), Antonella Galetta (Vrije Universiteit Brussel), Kerstin Goos (Fraunhofer Institute for Systems and Innovation Research), Leeroy Groves (University of Sheffield), Dara Hallinan (Fraunhofer Institute for Systems and Innovation Research), Richard Jones (University of Edinburgh), Reinhard Kreissl (Institute for the Sociology of Law and Criminology Austria), Marija Krlic (University of Sheffield), Charles Leleux (University of Stirling), Clive Norris (University of Sheffield), Charles Raab (University of Edinburgh), Rowena Rodrigues (Trilateral Research & Consulting), Stefan Strauss (Institute of Technology Assessment, OeAW-ITA, Austria), Ivan Szekely (Eotvos Karoly Policy Institute, Hungary), C. William R. Webster (University of Stirling) and David Wright (Trilateral Research & Consulting).